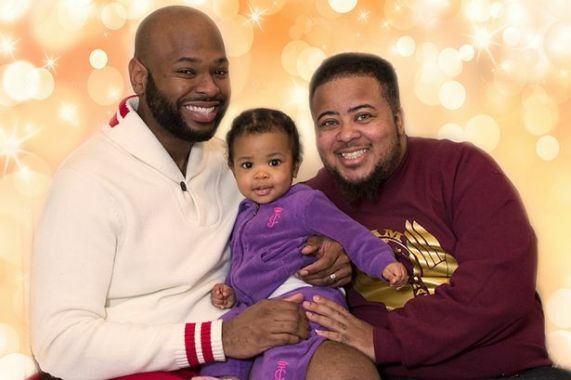 10 years after he transitioned from a woman to a man, Kayden Coleman found himself staring at the reflection of the baby bump in the mirror. He said it was totally unexpected. Not only had he told all his friends and family that he was transgender, he had been on testosterone jabs for five years, had grown facial hair and was about to have a double mastectomy. But then nature dropped a bombshell and, despite years of taking male hormones, Kayden became pregnant. Now he and husband Elijah, 27, are besotted with 22-month-old Azaelia and are planning to tell her all about her unusual family when she is five. Kayden was stunned when he first realised his growing belly was not the result of a lack of exercise, but a baby. Kayden was going through the mastectomy – or “top surgery” as he calls it – when he became pregnant. Doctors said it was because he’d had to take a break from the hormones before the operation. Still shell-shocked, the couple set about turning their flat in Philadelphia, Pennsylvania, USA, into a family home. And in July 2013, they got married . There was a lot to take in – especially for Elijah’s friends and family, who did not know Kayden was transgender. Security guard Elijah says: “It was such a personal thing that I felt if Kayden wanted them to know he should tell them himself. Kayden was lucky that most people failed to notice his bump but he did get some confused looks. He says: “This woman in a shop said to me, ‘Honey, you look like you’re pregnant’. I just laughed and said, ‘I am pregnant!’ She didn’t believe me.” His pregnancy went smoothly but when it came to the birth in December 2013, it was a different story. Kayden, who was in­­duced at nine months as he had high blood pressure , was in labour for four days. When Kayden first saw his daughter he was still in shock. He says: “Even when I first held her it hadn’t sunk in that she was mine, so I didn’t really feel much. But I knew things would never be the same again. I was so happy to finally see her face.” But when they brought Azaelia home, both parents found family life challenging, with Kayden giving up his job in a museum to take care of their daughter and Elijah working 10 hours a day to support them. Next articleAmber Ross now dating French Montana’s Homies?